South Korean multinational KD Navien has its sights set on the European market and has chosen Rotherham for its UK HQ. The leading manufacturer of condensing boilers also plans to open training centres and a research and development (R&D) facility in the Sheffield city region. It was entering lease negotiations following a visit to a number of sites in the region and was looking to set up temporarily for the first two years. The potential is to relocate to the Advanced Manufacturing Park (AMP) in Rotherham. KD Navien leads the way in the development of eco-friendly and high efficiency energy equipment and has recently launched a boiler combining new condensing and IT technologies. This means users can adjust their boiler by smartphone anytime, anywhere. The company is part of the KD group which has a turnover in excess of £4.6bn. KD Navien, the heating technology arm of the company, made $206m turnover in 2013 and is on target for $264m in 2014. Rothbiz understands that the company was strongly considering London as a first option due to the Korean community, but have now decided on the Sheffield city region. Progress has already been made in establishing a UK workforce in Rotherham with five employees in post and five more currently advertised. Cllr. Dominic Beck, cabinet member for Business Growth and Regeneration at Rotherham Council, said: "It is great to see another multinational manufacturing company located in Rotherham, helping to build the town's growing reputation as a global centre for modern manufacturing and technology. "With the world-class facilities we already have at the Advanced Manufacturing Park (AMP), the headquarters of KD Navien in Moorgate Crofts will join our growing community of global businesses in the town and will help to boost further growth in the sector. "This continues our ongoing efforts to create high value long-term sustainable jobs in Rotherham and retain our highest skilled people locally. It is important a modern economy is a well-balanced one that is able to provide employment opportunities for all." James Newman, chairman of Sheffield City Region Local Enterpise Partnership (LEP), added: "I am delighted to welcome an international company of the calibre of KD Navien to our City Region. "I am confident the company will continue to grow their business in the UK and use it as a springboard for European markets. "The ambitious plans for a heating technology R&D facility complement our strengths in innovating new advanced manufacturing techniques." Graham Parkes, UK representative for KD Navien (pictured, right), said: "There is an ambitious plan for growth with the goal to recruit up 100 employees and open training centres by 2017. "In the UK we have two bases, the European HQ in London and the UK HQ in Sheffield City Region. "The opportunity for growth is significant and we are confident we have the right products and support to take the UK by storm." 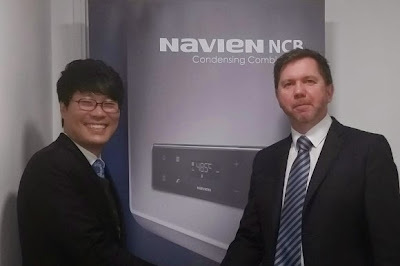 Founded in 1978, KD Navien (KyoungDong Navien) was responsible for launching Asia's first condensing technology in 1988 and the introduction of Korean-style condensing gas boilers in 1998. Operating the world's largest boiler manufacturing plant, with an annual manufacturing capacity of 1.5 million units, it is already the largest producer and exporter of boilers in Korea and aims to be the leading global boiler company by 2020.